SRAM revolutionised off-road groupset technology with the introduction of their 1X (one by) drivetrains 3 seasons ago. Now they're hoping the do the same thing for skinny tyre riders with the introduction of their Rival 1X and Force 1X road groupsets. SRAM's designers and test engineers have been looking at the bike differently, they've analysed the needs of cyclists and created a range of new 1X drivetrain offerings that aren't simply retargeted MTB groupsets but a new range of 1X11 speed groupsets with unique features that tackle the issues most commonly experienced by all riders. 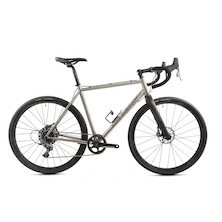 If you own a gravel bike, race cyclocross or just want the easiest to ride road bike with the most secure and quietest drivetrain then SRAM' s new, single front chainring, 1X road groupsets have your name on them. SRAM's new 1X road groupsets, Rival 1X and Force 1X have been created specifically for riders who live on skinny tyres. These are drop bar control groupsets for adventurous cyclists who's riding doesn't necessarily stop at the end of the road. These are road, cyclocross and gravel adventure groupsets for all riders. SRAM's new 1X groupsets are based on a number of unique, core design technologies. SRAM's X-Sync front chainrings are designed for keeping the chain on, not for shifting between two front rings. X-Sync uses a novel tooth profile that alternates thin and thick teeth every second tooth. This more accurately fits the chain profile, helping it to sit more securely on the ring and reduces the chance of the chain bouncing off as you traverse rough ground. SRAM's 1X rear derailleurs work in harmony with their X-Sync chainrings and are packed with features to make this operation as smooth and fluid as possible. Exact Actuation uses a 1:1 cable uptake ratio to deliver fast and precise shifts. X-Sync jockey wheels use the same thick-thin tooth profile to aid chain control as the X-Sync front chainrings. To limit movement of the rear derailleur to only the horizontal axis SRAM employ their X-Horizon technology where the shape of the rear mech parallelogram eliminates ghost shifting and helps reduce shift pressure for a lighter level feel. To compensate for switching from a double front to single front chainring SRAM's designers have added in extra teeth to the rear cassette to give you back usable gear range. With an 11-36 cassette out back and a 32T front ring you gain against a standard road 53/39 and 23T combo in terms of climbing ability and only lose a tiny bit in terms of flat out speed in the hardest to turn gear combo. Ask yourself this, when was the last time you spun out on 53/11? Ever, never, us neither. What SRAM's Rival 1X and Force 1X drivetrains give you is smoother shifting, longer drivetrain life, greater chain security, less weight and an elimination of redundant overlap gears. It's a simple to use, easy to understand package that's perfect for criterium racers, TT riders, as well as any type of narrow tyred off-road riding from cyclocross racing to just putting in the miles on your new Gravel bike. In fact, we think SRAM's new Rival 1X and Force 1X are perfect for all skinny tyred bike riding and racing. If you value simplicity and practicality we're sure that you'll agree.